The V&A Waterfront is as much a part of the fabric of the city of Cape Town as the mountain is. The harbour originally provided refuge to ships of the Dutch East India Company and during the 90s, development to reclaim the area resulted in the creation of the retail, lifestyle and entertainment centre that it is today. 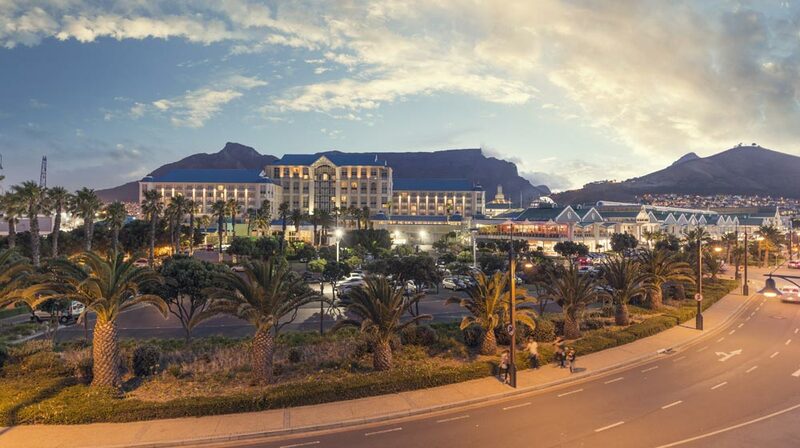 The Table Bay has an almost paternal positioning here; located at the very end of the pier, the hotel overlooks the whole of the waterfront area, with views of Table Mountain and the docks and is surrounded by the glistening aquamarine waters of the Atlantic seaboard. When they refer to its positioning as ‘the best address in Cape Town’ they’re absolutely right. 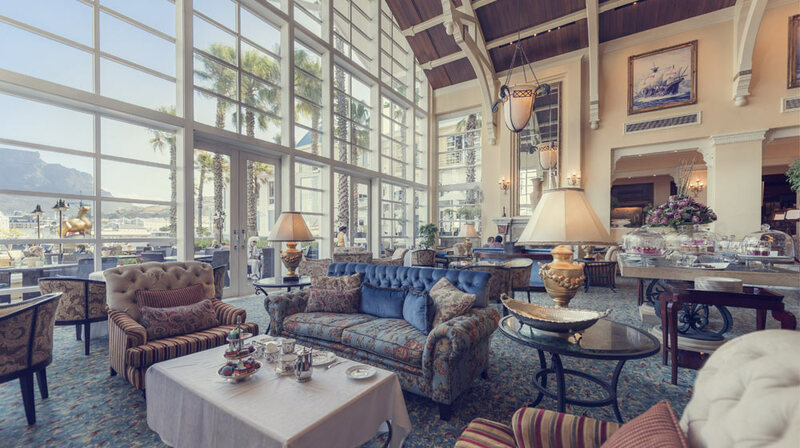 The foyer of The Table Bay boasts high beamed ceilings that give a sense of space and opulence. As you enter, your eye is immediately drawn to the large glass window frontage; the view overlooks the working harbour and is an ever-changing landscape as boats sail in and out. It’s quite mesmerising to sit in the hotel’s sunken lounge area and watch the scenery (this is also where they serve a fabulous high tea). 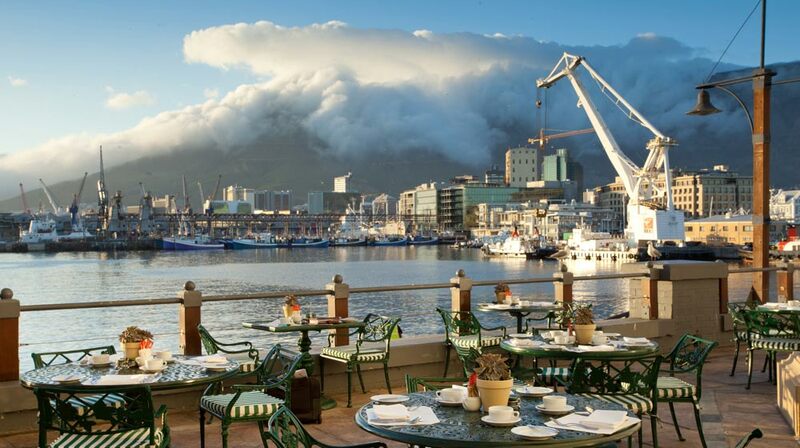 The backdrop of Table Mountain and the vibrant city beyond add to the charm. The hotel, part of Sun International’s Sunlux portfolio, is dedicated to providing a 5-star experience for its guests and is well-versed in this. Welcome drinks, a refreshing scented warm towel (always great if you’ve been travelling through airports) along with a seamless check-in, got things started off on the right foot for us. Our room at The Table Bay benefited from view over the harbour from the lounge area, as well as the Atlantic seaboard from the bedroom and patio areas. Even on an overcast and rainy day, such as the one when we visited, the views are still beautiful, if not even more so. Somehow the wet conditions seem to suit the harbour position and didn’t detract at all. A glass of the hotels ‘Captain’s Red’ with a selection of snacks in the room was the perfect way to arrive and unwind. Textured and patterned furnishings give the room a rich feel and the king size bed, with luxurious linen, make for an incredibly good night’s sleep. We also loved the addition of fresh flowers in the room (proteas – a nod to Cape flora) and a selection of sweet treats from the pastry kitchen. It’s impossible to visit The Table Bay and not be seduced by the proximity of one of the best shopping destinations in the city. The hotel has a direct access point from the lobby – escalators that will deliver you right into the shopping centre and more specifically to the luxury wing. You can head over to Louis Vuitton, Dunhill, Chopard and many more. The mall has everything you could possibly need and then some, and if the busy shops get too much for you, it’s a quick walk back to the sanctuary of your room. 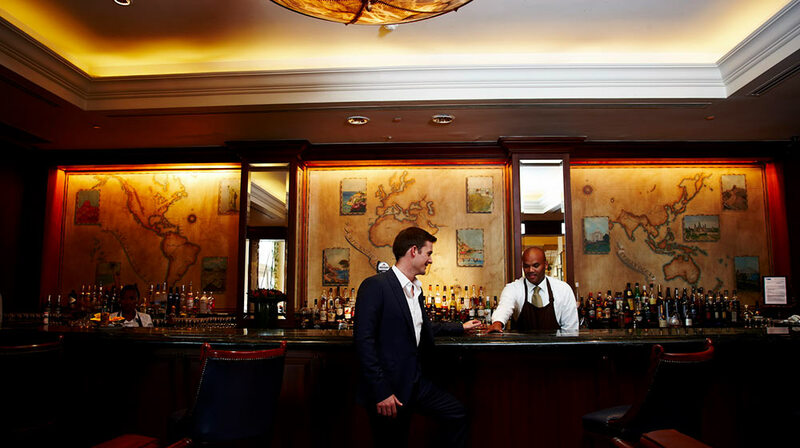 Before we sat down for dinner, we opted for a quick drink in the hotel’s plush Union Bar. On tap, we enjoyed the Table Bay’s very own Wild Legend Weiss beer and a glass of wine from the staggeringly broad wine list. 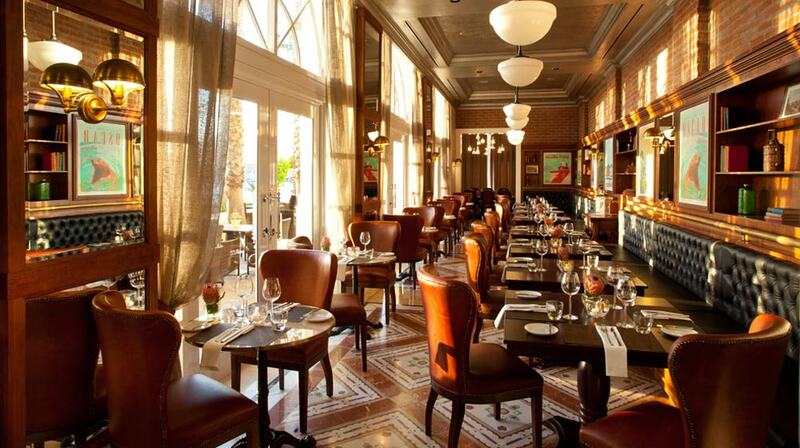 Camissa Brasserie is the hotel’s restaurant and the menu offers a selection of dishes with South African influence, designed to give tourists a hint of local flavour. Right now Camissa only serves dinner, but a fabulous Winter Lunch Buffet is due to start later on in July. 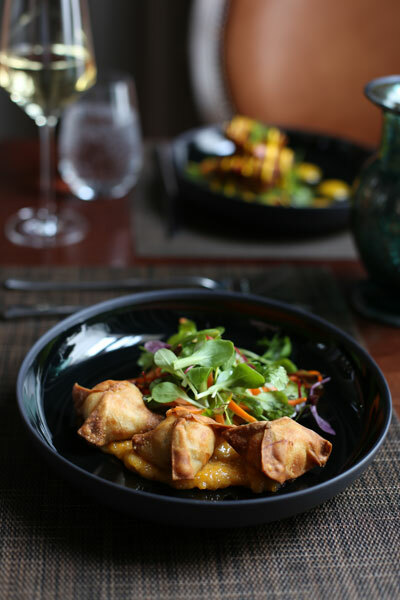 Chef Kershan Rambarun offers dishes such as Phyllo-wrapped Prawns served with a mango atchar and Smoked Snoek-filled Crispy Wontons. 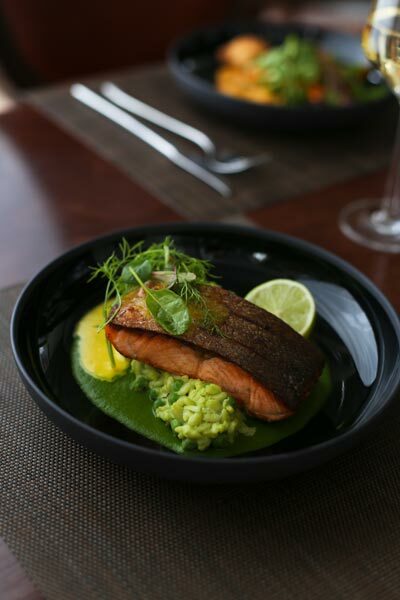 For mains, we enjoyed a piece of perfectly cooked salmon, served on top of a bed of pea and lemon risotto, as well as a really delicious pappardelle pasta with wild mushrooms. The pappardelle was wafer thin and silky and served with a creamy sauce with just the right balance of gorgonzola cheese. For dessert, the deconstructed caramel cheesecake was super light and paired with a yummy marzipan ice cream. You also can’t go wrong with the creamy crème brûlée, – a real treat! A talented live guitarist provided background music which was a really lovely addition to the evening. 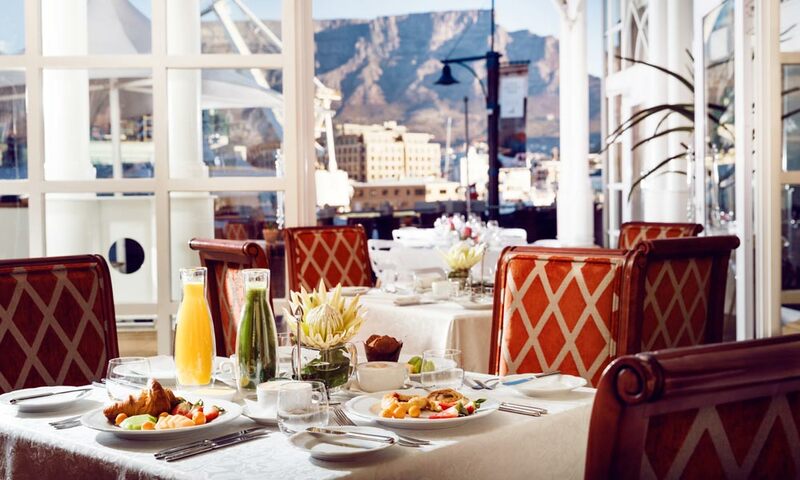 The Table Bay’s sumptuous breakfast spread is served in The Atlantic room. On the Sunday morning of our stay the heavens mercifully opened up and much-needed rain was coming down in torrents. The Atlantic provided a cosy spot to enjoy breakfast and rejoice in the rain. Beautiful melodies from a live pianist made the morning even more special. Everything you can imagine is available on the breakfast buffet, from fresh juices and smoothies to baked goods, fruits and yoghurts, a hot buffet, sushi, cold meats and cheeses and a waffle bar making sumptuous looking Belgian-style waffles. If you’re heading out for a day of exploring the Mother City, you’ll be well fed and fueled up to put lots of steps on your Fitbit. One thing we must mention is the fabulous Africology range of amenities provided in the bathrooms. The range is naturally scented with a combination of essential oils, and best of all, they are organic, fair trade and ethically-formulated, which is in line with the hotel’s sustainability focus. Although you can’t luxuriate in a bubbly bath full of it (the hotel has placed a lot of emphasis on water conservation during the Cape’s drought crisis) you can have a lovely, quick power shower and then use the body lotion afterwards to enjoy the amazing fragrance and benefits. When visiting the Mother City travellers are spoilt for choice when choosing where to stay but there is definitely something to be said for a hotel that consistently offers guests a world-class experience. The Table Bay is exactly that; seamless service, fantastic positioning and a wealth of knowledge in hoteliering make it a wonderful choice for foreigners and locals alike.